You can find Jonathan on LinkedIn or Twitter. This is our recent interview with him, as part of our Kinsta Kingpin series. I came to web design and development a little bit late in my life. I ran/owned a successful retail business in Chelmsford Essex, UK for a number of years. As a mature student, I earned a degree in Multimedia Development at Anglia Ruskin University and a PGDip in Design for Visual Communication at the London School of Design and Print. After doing the PGDip I did a number of projects (mostly in the area of Flash development and Expression Engine) as a part-time freelancer. I also continued to run my retail business. Then my American wife wanted to move back to the US (her father had become quite ill) and we sold the retail business and moved to Reno, Nevada (2006) where my wife had gotten a job with University of Nevada, Reno. It was a difficult decision and probably one of hardest in my life, however, I agreed. But on reflection, it wasn’t the best time to move to America. This is when I was introduced to WordPress (version 2.9). I was doing some (agency) freelance web development work and also trying to get local businesses interested in me helping them with their online marketing. This was a tough sell because a lot of them were just trying to just survive between 2006 and 2012! So I was looking for a simpler CMS that was still powerful and more customizable then Expression Engine. 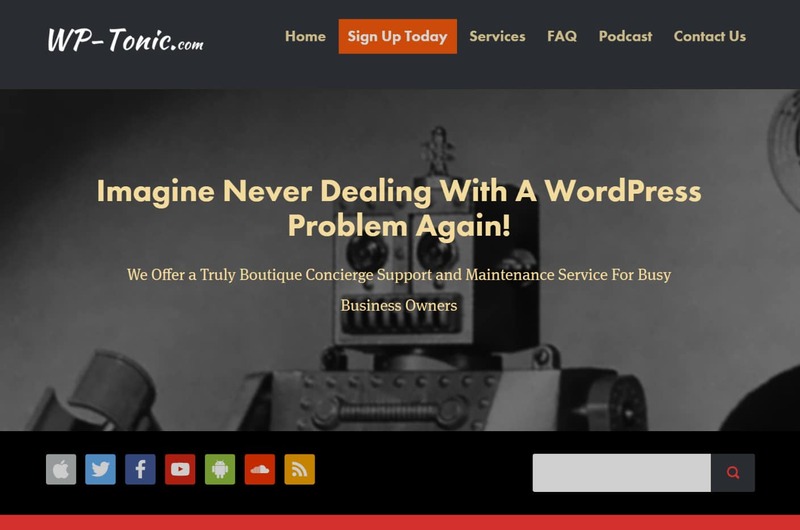 Nowadays I run an online WordPress maintenance and support company (WP-Tonic) that specializes in helping business owners who run membership and LMS powered websites. I also have been running a popular podcast for three years all about WordPress. Online marketing is totally different to the traditional brick and mortar business world. It has taken me quite a long time (probably too long) to realize that the real skill that counts in this world is SEO (search engine optimization.) Also, it’s easy to under-quote for work and get into situations that aren’t great for yourself and also the client. Another thing I have learned is you need to really specialize in a particular sector or have a sub-skill if you’re going to have a long-term career in this industry. The community. I know a lot of people say this, however it is totally true: I don’t know any online community like the WordPress one. However, this can be both a positive and also a negative thing. 2018 is going to be a real turning point in the history of WordPress. I’m interested to see where Gutenberg goes because I personally have not been totally happy with how this major project has been managed. In particular, I’m disappointed with the very poor communication level that was clearly shown at the beginning of its development from some key members of the project team. I also know quite a few frontend developers who are wondering whether or not they will have a future with WordPress, which I feel is quite sad. However, there are also bigger issues that all the drama linked to this project has uncovered related to the way WordPress.org is basically managed and controlled. Value for money, leading technology and great support plus some great tools to help with the development of a website, like including staging functionality. I’ve got to say that Kinsta and their team are excellent and I would highly recommend them to anybody who is looking for a real WordPress quality-hosting partner. I love walking, something very un-American “unless you have a dog.” Sorry, but it’s true, I get some very strange looks in the early morning when I do my regular walk. I think people feel I might be up to no good. Also, the mountains in northern Nevada are quite special and I like skiing. Basically, I like to be outside if I am not working in front of my computer. Morten Rand-Hendriksen: Morten is just a great guy and one of smartest people I know. Plus what you see in public with Morten is what you get in private. You can’t always say that about some of the other big hitters in the WordPress community.